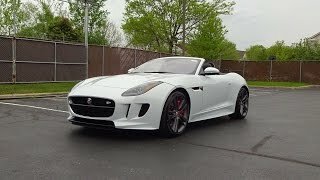 Jaguar released the first ever F-Type in 2012 as convertible followed by the Coupe rolling next year. The model in no time received numerous accolades all across the globe. Taking the same ahead with Jaguar F-Type British Design Edition 2016 the company shared the special edition dedicated to British design theme. 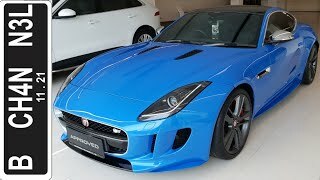 Let us have a look at the entire review of Jaguar F-Type British Design Edition 2016 to know in detail about it. The interior of Jaguar F-Type British Design Edition 2016 received some special tags to make it distinct being a special edition. The seats are wrapped in premium leather that features contrast stitching and British Design Edition embossed in headrests. The former can be had in three options, precisely Red, Ivory or Reims Blue. The aluminum trim work present over the center console of standard model gets replaced by the carbon fiber and comes with satin finish. Not only this, company has also made changes to the door sills which now has Design Edition lettering on them and monochrome Union Jack detailing. TO give the last blend with entertainment, they have introduced the 380-watt Meridian sound system with ten speakers which can be further upgraded to 770-watt unit with 12 speakers. 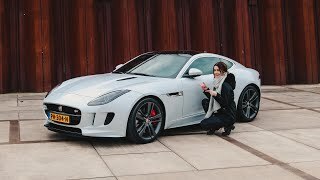 Thus rounding up the interior details of Jaguar F-Type British Design Edition 2016 I would say, the inclusions are enough to bring that ‘special edition’ feeling. The exterior of Jaguar F-Type British Design Edition 2016 is just like the interior; additions to the standard version, just to make it look special. This became possible with the Sport Design Pack and thus the front fascia receives a glossy black splitter, the grille is adorned with a new emblem while the rear end gets a new spoiler which we also noticed in the coupe while the side profile features new side sill extensions. The model now rolls over new wider 20” Cyclone wheels finished in Satin Dark Grey. Thus rounding up the exterior details of Jaguar F-Type British Design Edition 2016 all I can say is, that like any other ‘special edition’ model, this one also gets subtle changes that make it look unique. Beneath the hood of Jaguar F-Type British Design Edition 2016 is the same 3.0 liter V6 generating total output of 375 hp and peak torque of 460 nm. The performance figures of Jaguar F-Type British Design Edition 2016 depend upon the transmission you use and thus the 0-60 mph sprint can be knocked anywhere in between 4.8 to 5.4 seconds.